Forky’s is a difficult place to classify. 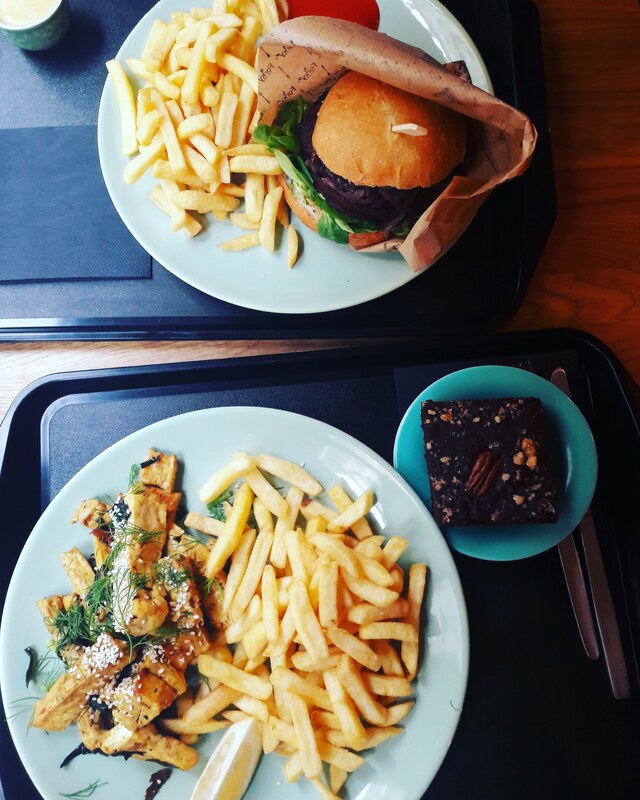 On the one hand it’s got glorious, slightly greasy fast food, and on the other it’s got build-your-own buddha bowls. I’d like to say it’s the latter that lure me in, but you probably know me by now. If it doesn’t come with a side of chips, I’m not interested! At least there’s something for everyone, but this will be a fairly one-sided review. On my first visit I got the kebab (it’s an all vegan establishment, so you can take your pick from the menu). I never ate a kebab when I was a meat eater, and possibly never even tried a veggie version when I was a vegetarian. But now I’m a vegan (and living in Europe may also be a factor), I can’t get enough of kebabs. I judge a kebab on the texture of the mock meat, and the seasoning. 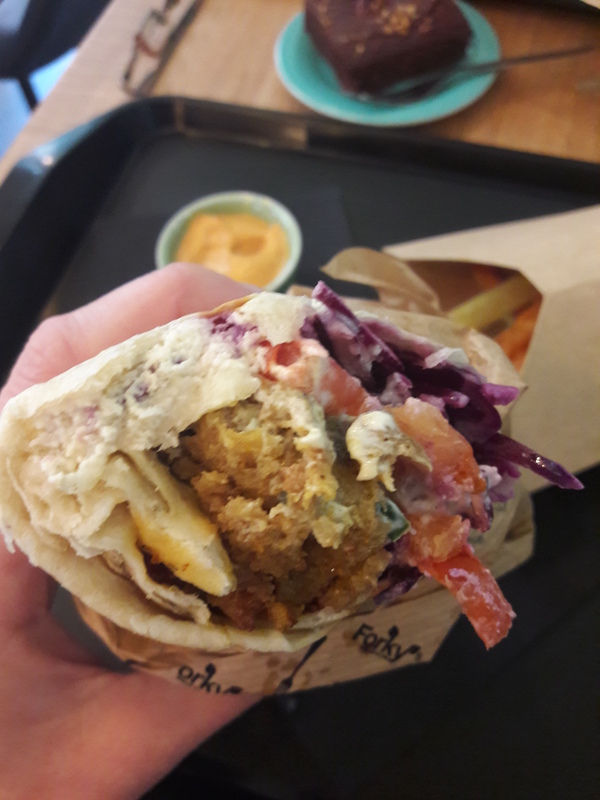 In my opinion the best vegan kebab in Prague can be found at Paprika, but this is a solid runner up – it might even have nicked the top spot were it not for the abundance of red cabbage rolled up in there. 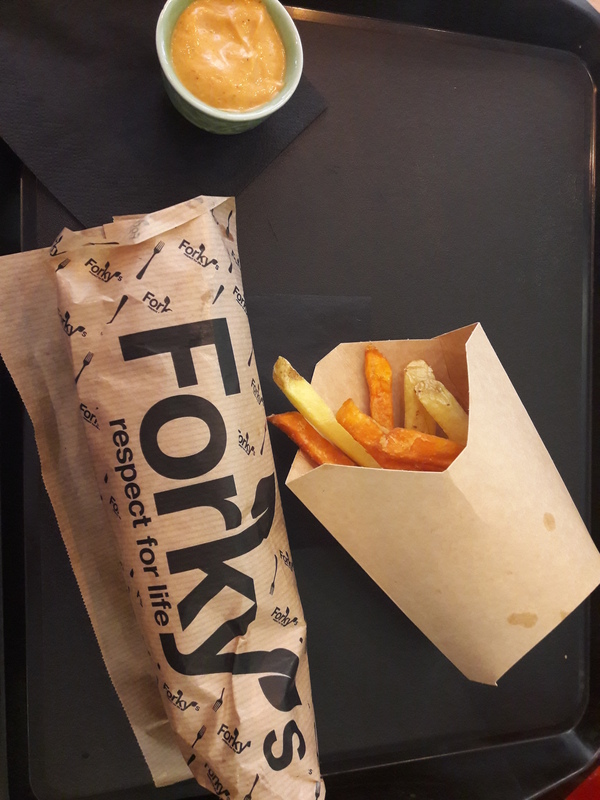 That first time I was a little disappointed to find that the chips were a mixture of regular and sweet potato fries. Don’t get me wrong, the sweet potato has its place. But I find myself becoming increasingly impatient with places that offer chips and they turn out to be orange instead of yellow. Sweet potato chips just don’t have that perfect texture, do they? They’re like slightly soggy, off-brand chips. So imagine my delight when I returned recently and found that proper potato chips were now the order of the day! What a step up. 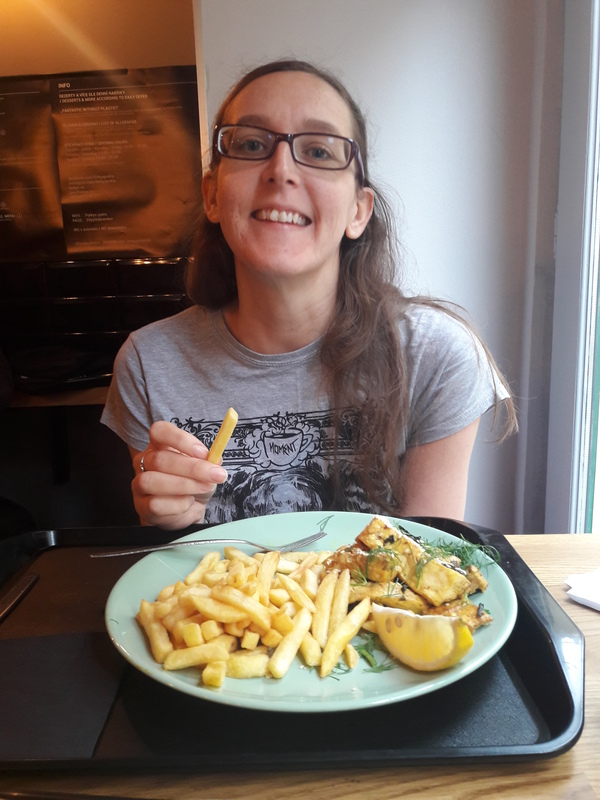 The menu had generally been jazzed up as well, so that it now included fish and chips, which no Brit living abroad can reasonably be expected to resist. 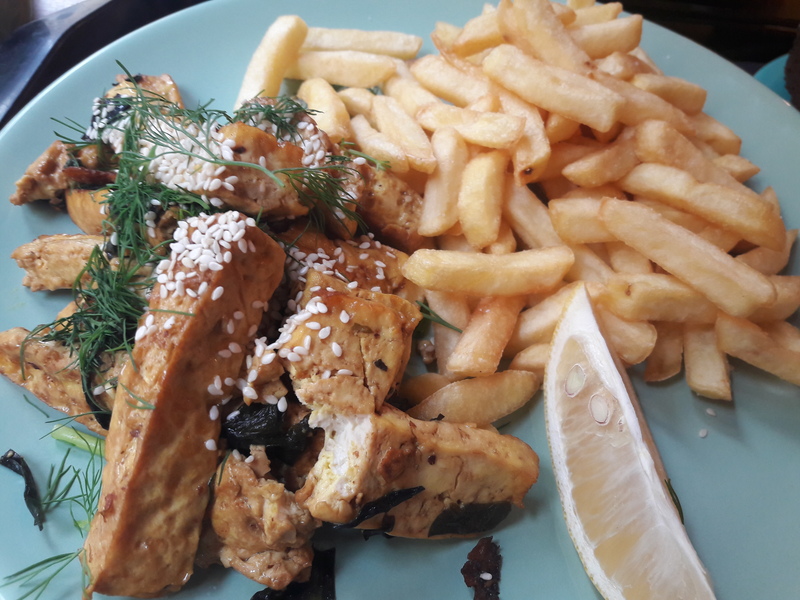 My poor eyesight led me to believe that the picture behind the counter was showing battered tofu for the fish – alas, that was not the case. The tofu was extremely nicely flavoured and it was a very delicious meal, but it was lacking a little in the texture department. The gigantic portion of chips did make up for it though, and I really enjoyed this dish. And Dr HH loved his French burger. The caramelised red onions were delicious, and the mustard was good and warming. The patty itself had a good texture and flavour, and overall he was a very satisfied customer. 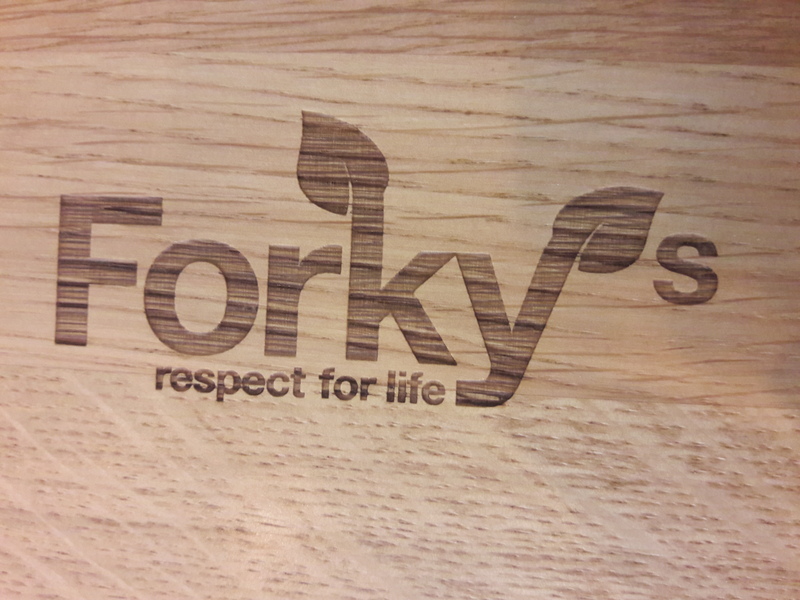 I’ve only ever seen one dessert at Forky’s, and fortunately it’s a good ‘un. 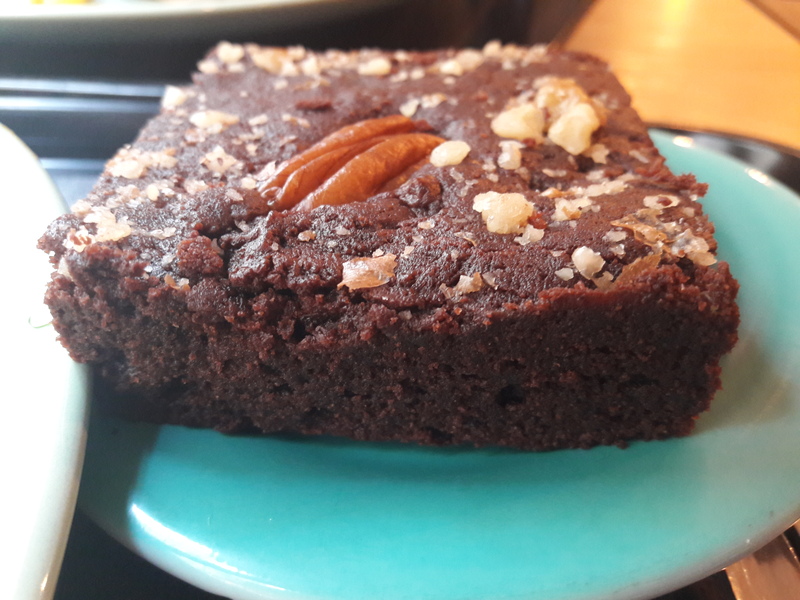 I love a good brownie, and this one is certainly chocolatey enough for me and is quite fudgy in the centre, but can be a wee bit crumbly elsewhere. Also, it’s served on a ridiculously small plate, especially if you’re planning on sharing. That said, maybe they’re trying to discourage splitting desserts, which is certainly a policy I can get on board with. And just imagine there’s a review of all the nourishing, balanced buddha bowls here! All in all, I like the food at Forky’s but go rarely because it’s close to the city centre which is always crowded with tourists. 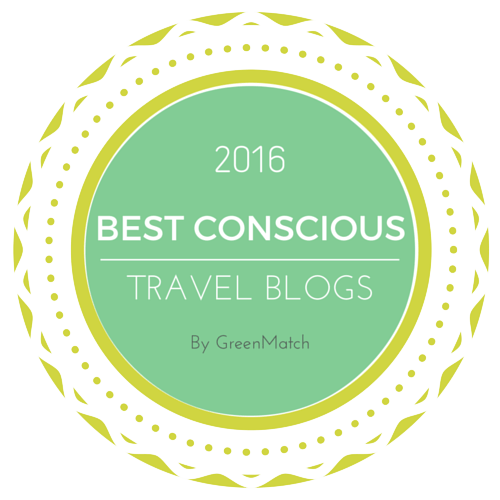 So if you’re sightseeing, you should definitely go! It’s a casual, canteen-style eatery where you order at the counter and wait for your number to be called out. It’s not fancy, but it’s filling and tasty, and sometimes that’s just what you need. 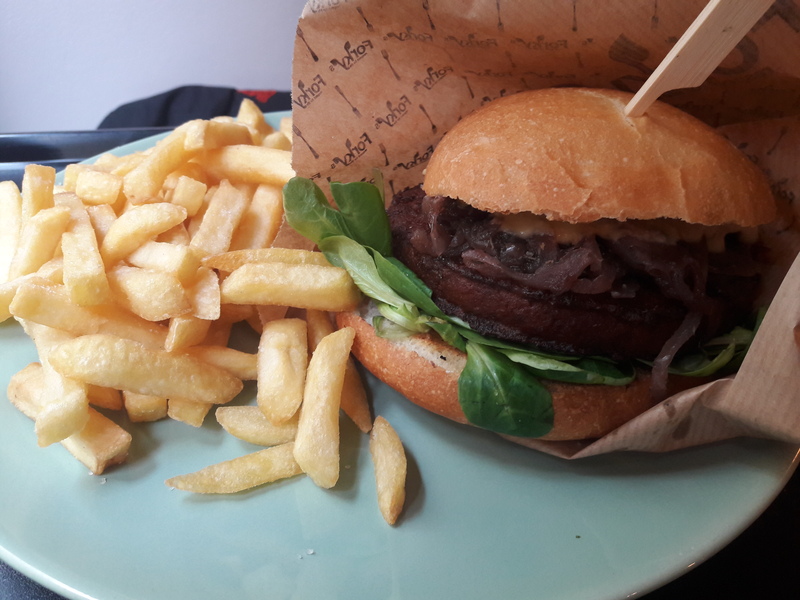 This entry was posted in Travel and tagged Forky's Prague, vegan Prague, vegan travel. Bookmark the permalink. The kebab sounds really good, and the fish and chips plate looks great!